This gets a Groan-. These are bland and meaningless. There's no conference significance to them aside from Leaders being a nod to Michigan, I guess, although Michigan isn't even in that division. For all of the talk of trying to honor the greats of the conference etc., this is a truly abysmal showing. This is mostly inoffensive besides the fact that it looks like it should be on a billboard for an anti-smoking ad. 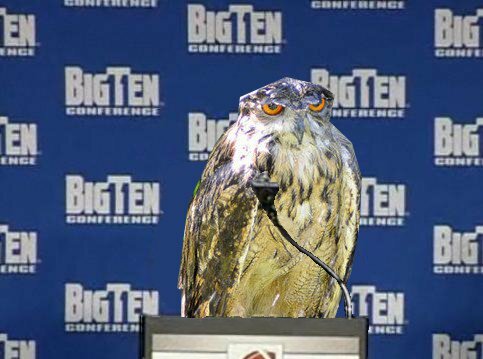 My biggest problem is the 10 allusion in B1G. 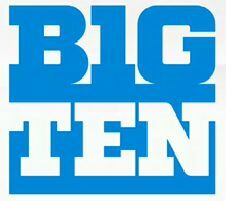 Even the old logo acknowledged that there were 11 teams in the Big Ten. I understand it's a little harder to do with 12, but I don't know why they're playing up the number 10 in the logo and making no concession to the fact that the conference has 12 teams. I would have liked to have you as a teacher. This is a very generous grade. I agree with you that the "10" makes no sense.There have not been 10 teams in this conference since PSU joined in 1990. So why they have chosen now to go out of their way to highlight the "10"? I understand the name of the conference is a brand and that was going to remain the same, but either find a way to get a 12 in there (I'm sure creative minds could have done it), or ignore the number altogether. I thought it was a fair grade. To get worse than a C-, you have to be outwardly offensive. Like Carlos Mencia or Greg Oden. The logo and division names are totally serviceable.